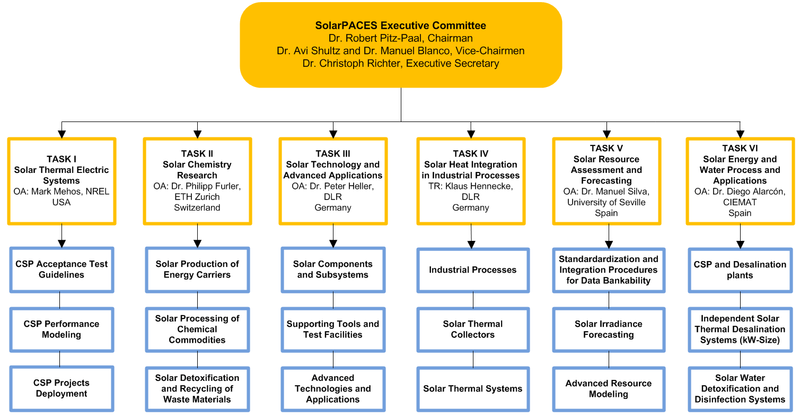 The Executive Committee (ExCo) is responsible for control and supervision of the SolarPACES Program as a whole. Individual members of the Executive Committee represent their national Contracting Party. The SolarPACES Secretariat (ExSec) is responsible for communications between the members of the ExCo and Operating Agents, and relations between the SolarPACES Program and the IEA, governments, international bodies and relevant media. For each of the Solar Research Tasks; Operating Agents (OA) or Task Representatives (TR) are the central coordinators of the research.